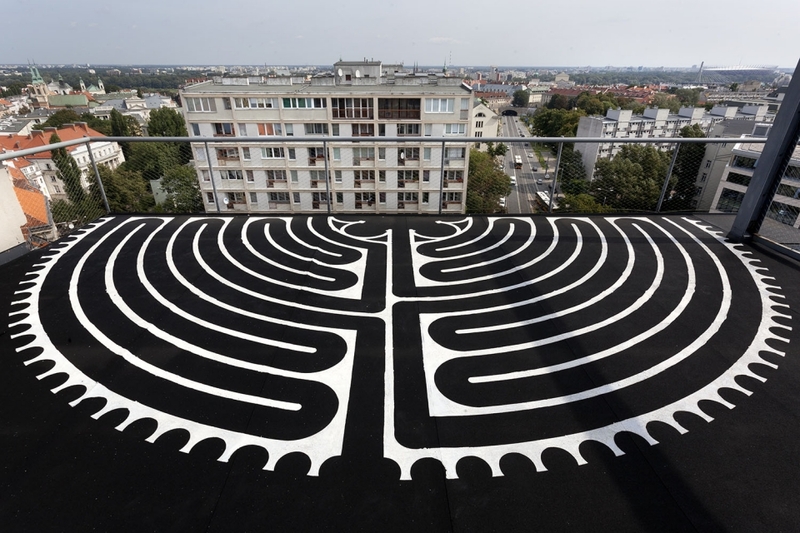 In the open air, on the terrace of the 11th floor of a building at 64 Aleja Solidarności, within the boundaries of the former Ghetto, roadways have been traced in the shape of the labyrinth of the marble floor of the Chartres Cathedral. The “Warsaw Labyrinth” has been reversed and cut precisely in half, on the edge of the terrace of Henio’s and Edzio’s former studio. The second half of the labyrinth is lost in the darkness of what happened in the summer of 1943 and 1944. What is left is the part on the terrace, symbolizing prayer, hope, and the will to survive. People ask me why I have used the word “naked.” The halved labyrinth makes me think of a naked woman, a standing female figure stripped of her clothes. When I was doing the installation The Bottom of the Sky on the terrace of Edward Krasiński’s studio in 1994, I immediately wanted to follow up with another, Naked Chartres, on the same site. But the place was already slated for a makeover and nothing came out of it. About a year and a half ago I met Andrzej Przywara and told him about my unrealized plan. Przywara told me that the Foksal Gallery Foundation had a similar terrace/roof built upstairs, above the former terrace. I was very keen to return to my original plan. I knew that the place’s breadth and the diameter of the Chartres Labyrinth were almost identical. Naked Chartres is a very significant project for me that I was to carry out, living for many years in Poland. It carries two important messages. The first one is a prayer to life, as if with hands extended over Warsaw, and the other is the interruption in half of the path to its fulfillment. The two — the Prayer and the City — stand facing each other. I mean the tragic history of the Warsaw Ghetto Uprising and the Warsaw Uprising. Some time ago I visited the Chartres Cathedral and saw the beautiful labyrinth which for me is the most important element of the magnificent building. A broad panorama of Warsaw stretches from the 11th floor of the tower block at Aleja Solidarności, where Henryk Stażewski’s and Edward Krasiński’s studio used to be. There the fate of a ruined city and a labyrinth cut in half merged in my mind.